Aliens Have Landed, Infiltrated British Nuclear Missile Sites and Deactivated The Weapons, According to U.S. Military Pilots. The beings have repeated their efforts in the U.S. and have been active since 1948, the men said, and accused the respective governments of trying to keep the information secret. The unlikely claims were compiled by six former U.S. airmen and another member of the military who interviewed or researched the evidence of 120 ex-military personnel. The men's aim is to press the two governments to recognize the long-standing extra-terrestrial visits as fact. They are to be presented on Monday 27 September at a meeting in Washington. "The U.S. Air Force is lying about the national security implications of unidentified aerial objects at nuclear bases and we can prove it." "I was on duty when an object came over and hovered directly over the site. "The missiles shut down - 10 Minuteman missiles. And the same thing happened at another site a week later. There's a strong interest in our missiles by these objects, wherever they come from. I personally think they're not from planet Earth." Others claim to have seen similar activity in the UK. Col Charles Halt said he saw a UFO at the former military base RAF Bentwaters, near Ipswich, 30 years ago, during which he saw beams of light fired into the base then heard on the military radio that aliens had landed inside the nuclear storage area. "I believe that the security services of both the United States and the United Kingdom have attempted - both then and now - to subvert the significance of what occurred at RAF Bentwaters by the use of well-practiced methods of disinformation." The site was then the base of the U.S. 81st Tactical Fighter Wing. 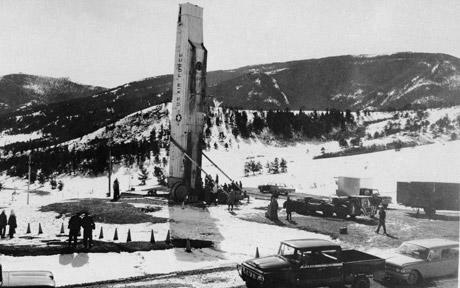 Capt Bruce Fenstermacher, a former U.S. Air Force officer, also claims he saw a cigar-shaped UFO hovering above a nuclear base in Wyoming in 1976.